Welcome my friend, Robyn Echols to my blog as she announces her newest book, The Fourteenth Quilt. 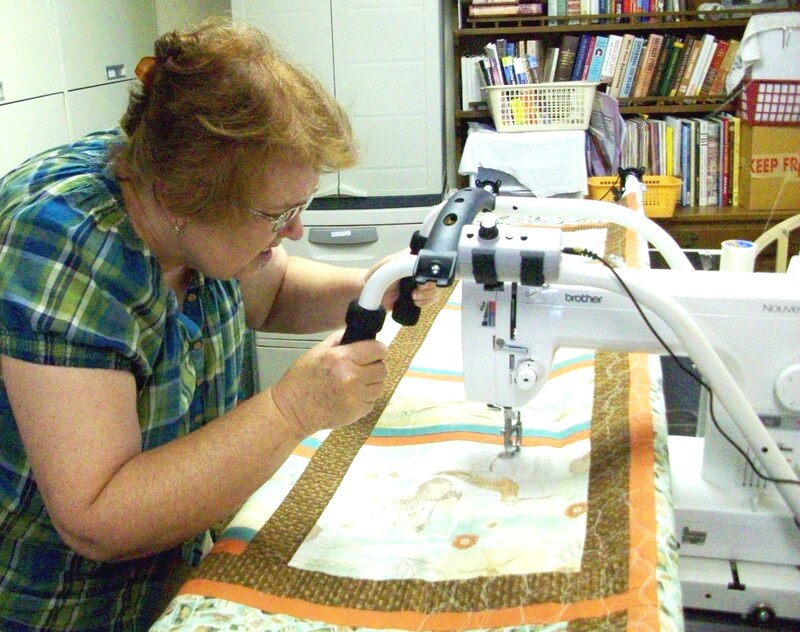 Annie, Ce lia and Lynn are all that are left of the Relief Society quilting class, but they are still determined to make baby quilts for the new mothers at church. Annie, who is just south of eighty years old, calls the quiltsters (short for quilting sisters) together to ask for more. She wants to make lap quilts to give to some of the “forgotten” oldsters she sings to each week at the nursing home—something to wrap them in love at Christmastime. It’s a good idea, but the trio discovers that life and making quilts don’t always go as planned. The quiltsters discuss recipes and quilting ideas including a crocheted cat mat to use up their fabric selvage and trim scraps, all of which they share in the book. Sarah and Brian meet at the university. Their first date is after Sarah’s First Saturday Block of the Month class she attends with her mom at the local quilt shop. Their romance grows, and they plan their future together—a plan that will require them to be separated for six months before their wedding. But, can they bear to be apart that long? What wraps together this Christmas tale? The Fourteenth Quilt. Lynn had no sooner reached the middle of the next row than she ran out of bobbin thread. With a sigh, she lifted the unquilted fabric and stuck her head underneath as if she were an old-timey photographer focusing her shot. She opened the bobbin compartment and removed the spent bobbin. This is ridiculous! I can’t see a thing under here. Lynn unfastened the side tension clips and threw the fabric up over the top of the sewing machine while she exchanged the empty bobbin for a full one. As she refastened the fabric in place, she decided next time she would clip the top thread and slide the machine to the end of the quilt. Surely it would be easier to deal with threading needles and changing bobbins in the full light and without also fighting the fabric. Once Lynn replaced the bobbin and rotated the needle to catch the bobbin thread, she slid the foot pedal over several inches, grabbed the handles to the sewing machine tray, grit her teeth and started stitching. But, I’m not there yet. The door swung open and slammed against the doorstop with a thud. Startled, Lynn lifted her foot to stop the machine and stared at her husband. Del shook his head as he pulled the door closed. Lynn looked down at the frame and froze at the sight of the gold and white long-hair cat stretched out across the section of quilt secured between the two upper poles. With a huff, Lynn once again approached the quilt frame. To see more photos that go with the chapter from which this excerpt was taken, please click HERE. Robyn Echols has been writing since she was in junior high school. By choice, she spent most of her evening hours in her “dungeon”, as her mother called her downstairs bedroom, writing stories, only joining her family in front of the television upstairs when her favorite programs were playing. She has spent hours learning and teaching family history topics, and focuses on history from a genealogist’s perspective of seeking out the details of everyday life in the past. 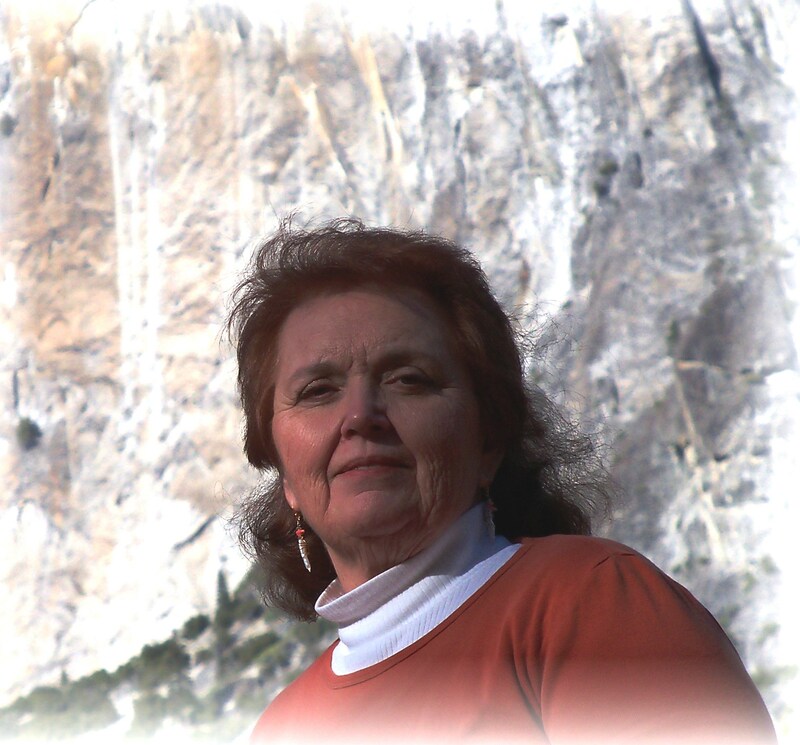 Now Robyn resides with her husband in California near the “Gateway to Yosemite” and has fun researching and writing the books that she hopes will interest and entertain her readers. She writes Young Adult/New Adult and contemporary fiction under Robyn Echols and adult historical romance under her pen name, Zina Abbott. The author is a member of Women Writing the West, American Night Writers Association, and Modesto Writers Meet Up. She currently lives with her husband in California near the “Gateway to Yosemite.” She enjoys any kind of history including family history. When she is not piecing together novel plots, she pieces together quilt blocks. Have you steamed your Figgy Pudding yet? Because my mother was of English descent, I had the good fortune to witness first hand the making of a steamed Christmas pudding. I even tasted one. It’s not too bad. From the 15th to the 19th Century, Figgy Pudding had its hayday, being the traditional pudding served at Christmas time feasts in the British Isles. In fact, the pudding was so good, the carolers would not leave a party until they got some. The British had the right idea, make a fruit-like cake and douse it with booze. Some are even set aflame. Beyond the symbolism, the Christmas Carols, the trees, the lights, loads and loads of scrumptious food, and of course, the Figgy Pudding, is Holiday traditions. What are your Christmas traditions? Do open one gift on Christmas eve? Watch “A Charlie Brown Christmas?” Visit Santa at the mall. Go caroling? I always go “a Caroling.” Get it. My name is Carol therefore I’m always “Caroling.” Bad joke, I know it. 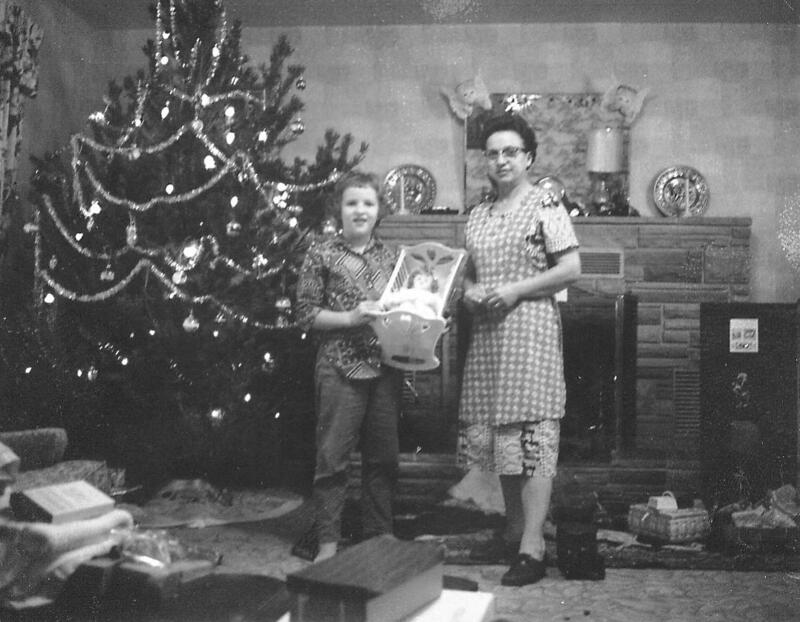 This is a picture of me and my mom and the baby doll I asked Santa for. Yes, Virginia, I did believe in Santa for a long, long time. Still do. Whatever your traditions, I’m wishing you a very Happy Holiday celebration with your family and friends around you. I do hope you’ll have a terrific start to a New Year. May your lives be blessed.